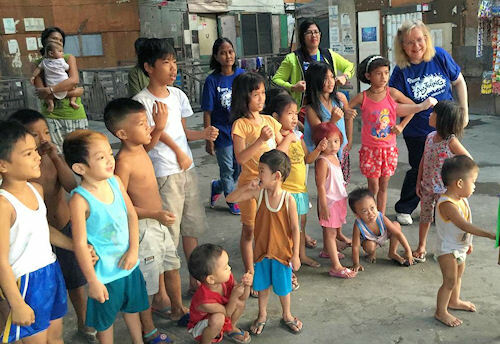 Pastor Bev Sumrall of Cathedrel of Praise in the Philippines reports on the day to day impact of Sunday Line's assistance. 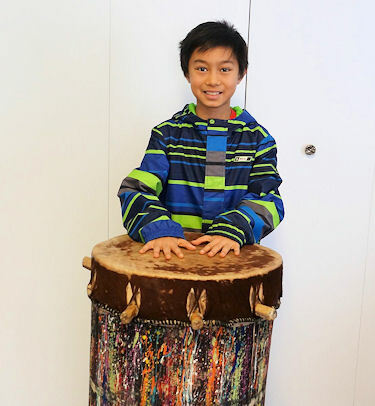 The winner of the Watoto drum this year was 10 year old Mark Lubog. Fortunately his family lives in Port Coquitlam and they were able to drive out to White Rock on Monday to pick up the drum as it was the father's day off and a pro-day for the children. The drum was heavy and awkward (as Helen will attest) and I knew it would be difficult to transport it to an out-of-area winner. Mark's parents come from the Philippines, though the 3 children have been born here in Canada. The lady in the photo is Mark's aunt as his mother was working and not able to come with them. Last year's drum winner also stopped by the booth for a chat. The winner of the Ugandan elephant is Cassidy Spyker of Abbotsford. I will meet her on Sunday afternoon and find out more about her story. Interestingly, my maiden name is Cassidy and so I was happy to announce her as the winner! At least 158 people came through the booth, signed up for the drum or elephant and had interaction with Sunday Line. Of those, 54 asked to receive a monthly e-mail letter and 1 young lady would like to be added as a prayer partner for our monthly needs. 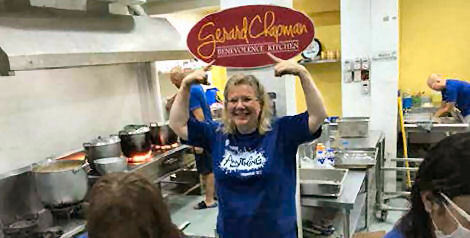 Thank you to all across Canada who faithfully support Sunday Line ministries! It is always rewarding to pass along the funds from you, our donors, to our mission partners. 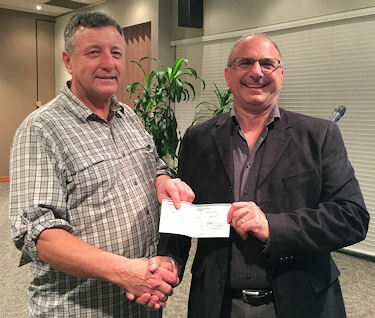 Sunday Line director, Ron Marriott, was privileged to hand-deliver a cheque to Sergio Bersaglio, director of Villages of Hope Africa, during his Fall fund raiser. Metro Kids is thankful for Sunday Line sponsorship that allows them to encourage and empower hundreds of at-risk children with hope to lead lives of significance. 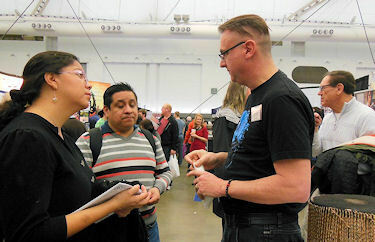 Hannu Hauka, of Great Commission Media, expressed his thanks for the Sunday Line donation to the boys in the prison camp in the Volgograd region of South Russia. The funds were much appreciated and used to buy gifts of warm clothing, personal hygiene kits and food for 300 boys in the camp. warm clothing, personal hygiene kits and food. 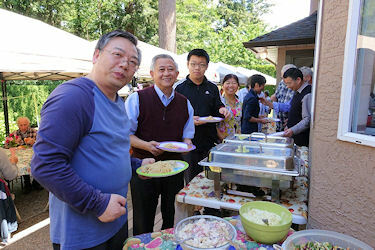 The last weekend in May was special for Sunday Line Fellowship. The Omega students, from the 1 year mission course at Summit Pacific College in Abbotsford, BC, returned after their 3 weeks in Thailand and shared how they had been able to bring smiles to the faces of many children as they interacted with games and activities in the school classrooms. Following the service we gathered at Roman and Pat's home for a bounteous barbecue. 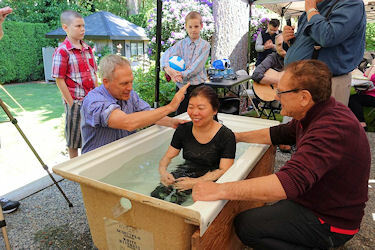 The highlight was the water baptism of four, including the Zhao family who has recently come to Canada from China. 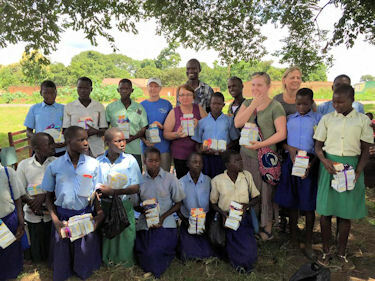 For the third summer, Linda Wing and her husband, Jamie, traveled to Uganda to serve with Watoto ministries - this time hosting their own team. 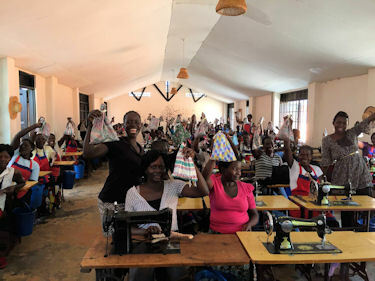 They focused their time in the northern Gulu area at Living Hope, a Center established to restore purpose and dignity to marginalized and vulnerable women. 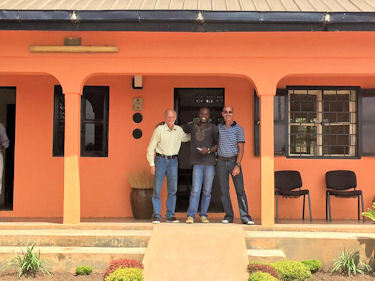 Jamie worked alongside some wonderful people as he gave many of the buildings a new look with a fresh coat of paint. Linda experienced the hard toil that goes into making one of the for-profit products sold when the Children's Choir goes on tour. She spent a day learning how to cut the material, operate one of the sewing machines and, tediously, stuff the toy cloth giraffes. She also participated in the "Keep a Girl in School" program by packaging up personal care products, loading them onto a bus and driving some distance away from the Living Hope Center to deliver them. This program is a wonderful blessing to the girls as it enables them to remain in school and thus have an opportunity for a more extensive future. The gratitude of the school and the young girls was overwhelming! 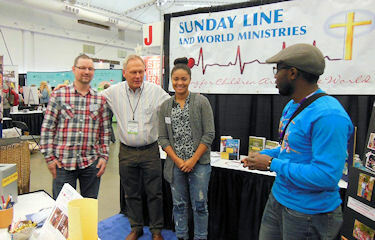 Helena has become even more popular since she won the Ugandan drum at the Sunday Line Missions Fest booth the last weekend of January! 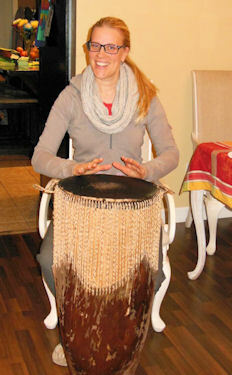 Friends are calling and asking if they can borrow the drum for special events for their ministry groups. 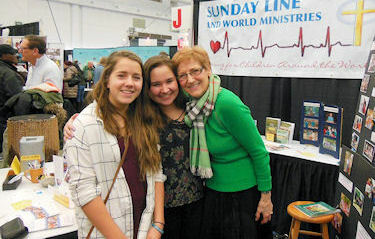 Helena, a post-grad student and part-time grade 7 teacher, is passionate about missions and evangelism. 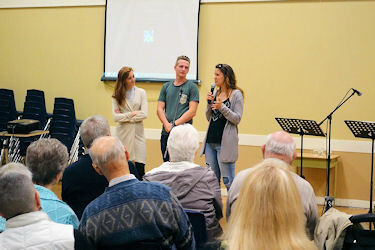 She has been actively involved with a local bus ministry, with First Nations Ministries and with YWAM internationally in Bulgaria. It was a pleasure to gift her with this drum from the Watoto Children's choir. "This is a good motivation to take up music once again," enthused Helena. 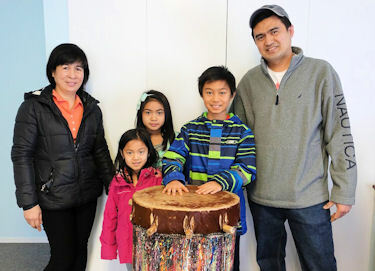 More than 200 people entered the draw for the Watoto drum. 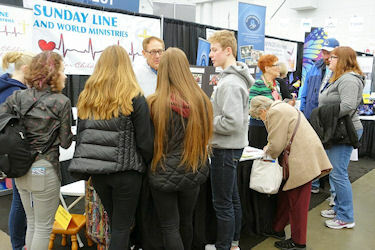 It is encouraging to note that the directors and volunteers participating in the Sunday Line booth had the opportunity to speak with and invest in the lives of at least 200 people plus many others who stopped by the booth and did not sign up for the draw. The theme for the weekend, "Mission: Being or Doing" was of significance for the thousands who attended the workshops and plenary sessions. 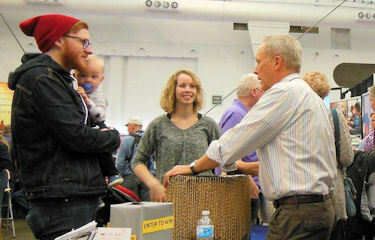 Cindy Meyer, Pat Kozak, Don Winsor and Dan MacTavish interacting with attendees.